“Every time you win it means something. Each year we have new players. And every (championship) has its own significance.” ~ Tony Alexis, co-manager of the Red Nation Jets. Make that five consecutive national championships for the Red Nation Jets. 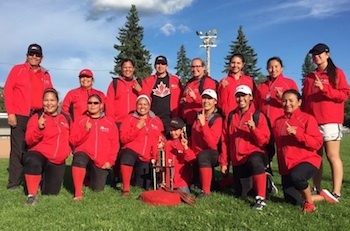 The women’s squad won yet another senior title at the Canadian Native Fastball Championships, which concluded this past Sunday in Prince George, B.C. For record keeping purposes the Red Nation Jets are listed as being from Alberta’s Alexis Nakota Sioux Nation. But that’s only because the squad has been co-managed by Tony Alexis, the current chief of the First Nation, along with his wife Stephanie. The Red Nation Jets, however, who only play in the one national tournament each season, are comprised by some of the top women’s players from across the country. This year’s squad featured players from Alberta, Manitoba, Ontario and Saskatchewan. The Red Nation Jets allowed just one run in the entire tournament. Their closest match was a 4-0 triumph versus the Edmonton-area Alexander Teepee Crawlers. The club won all five of its matches while on their way to another championship. It blanked a team from Ontario’s Curve Lake First Nation 10-0 in its final game, which only lasted five innings due to a tournament mercy rule. Once again, the Red Nation Jets’ roster this year featured shortstop Carey-Leigh Thomas, who is from the Six Nations community of Ohsweken, Ont. The week before the national tournament, Thomas helped Canada capture a bronze medal at the world women’s softball championships. The world tourney was held in Surrey, B.C. Thomas was able to suit up for the Red Nation Jets because the Canadian women’s softball club did not qualify for the Rio Olympics. Alexis was obviously thrilled Thomas was able to suit up once again for his side. “She’s a great player,” he said, adding Thomas was approachable to opposing players and fans who wanted to meet her during the tournament. While the Red Nation Jets only participate in the nationals, some team members do play together elsewhere. For the third straight year, Wayne Auger, a Métis who lives in Edmonton and has been involved in fastball, first as a player and then as a coach, for more than five decades, served as the Red Nation Jets’ head coach. This year’s nationals attracted 77 clubs in five divisions. The senior women’s category featured 22 entrants. Auger’s 27-year-old daughter Courtney pitched three of the Red Nation Jets’ games this past weekend, including the one that clinched the title. Despite the fact the team turned in some more dominating performances, the elder Auger didn’t think this was necessarily the most talented group he’s worked with. Also, Jess Martin, another key player from last year, is recuperating from a knee injury and was unable to play. But Martin still made the trip to Prince George and served as an assistant coach for the club. “I’d rather have had her playing,” Auger said. One of the newcomers on the squad was 16-year-old Ontario catcher Taylor Hill from Six Nations. Despite her youthfulness, Hill played like a seasoned veteran. At most national tournaments a host for the following year is announced. But that wasn’t done this year. Instead it was revealed the event will be staged in Alberta and officials are still considering three bids, including one from the Alexis Nakota Sioux Nation.